Blog: This Art Fair began as a TRAIN!!! This Art Fair began as a TRAIN!!! The KY Guild of Artists and Craftsmen will hold their 50th anniversary Fall Art Fair this weekend in Berea! As the third oldest art guild in the nation, and one of its finest, the KY Guild began as a train!!! 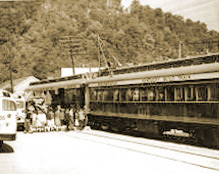 The Guild Train was the nation's first Art and Craft train. Its goals were the same as the KY Guild's is today: bring fine art and craft to America's people, teach the arts to all who are interested, and help artists find economic security with the making and selling of their work. Dedicated by Gov. Bert Combs and donated by Louisville/ Nashville Railroad, it ran across this state for seven years, back and forth, influencing several hundred thousand children and adults. It would stay in one place for a few days and demonstrate woodworking, weaving or ceramics, show off finished products and literally "find" craftspeople in very rural communities. This weekend, you can drive a few miles to revisit the same experience. Take either exit off I75 at Berea and follow the signs to beautiful Indian Fort Theater. Hope to see you there! I will have my jewelry and Bill will sell his soy soaps and candles. The guild will stage its annual fall craft fair at Indian Fort Theatre, 2047 Big Hill Road (KY 21), on Saturday from 10 a.m. to 6 p.m. and Sunday from 10 a.m. to 5 p.m. Many art media will be represented including: painting, wood turning and outdoor furniture, jewelry, pottery, handmade children’s clothing, stone work, photography, clay board etching, metal work, handmade soap and body products, stained glass, dolls and rugs to name a few. Admission is $5 and free for children under 12. Plenty of free parking is available at Indian Fort Theatre. For more details, visit www.kyguild.org, call 986-3192 or e-mail info@kyguild.org. A CHEAP TRICK FOR HALLOWEEN DECOR!